Protect your shades in laid-back style with the Croakies Suiters Eyewear Retainer. These soft and comfortable Croakies are perfect for casual fun-in-the-sun activities like hiking, Frisbee, or wandering about town. Cinch the adjustable slider bead tight to your head for a secure fit or pull it all way back for a relaxed fit. Made of knitted polyester yarn, these Croakies feature a vibrant and original Sunrise tie-dye print from Jammin On. Easy to care for and washable; 28 inches long; fits small to medium sized frames; made in the USA. Croakies has been creating stylish, durable, and functional products for life's everyday adventures for more than 40 years. These soft and comfortable Croakies sunglasses straps are perfect for casual fun-in-the-sun activities like hiking, Frisbee, or wandering about town. Cinch the adjustable slider bead tight to your head for a secure fit or pull it all way back for a relaxed fit. 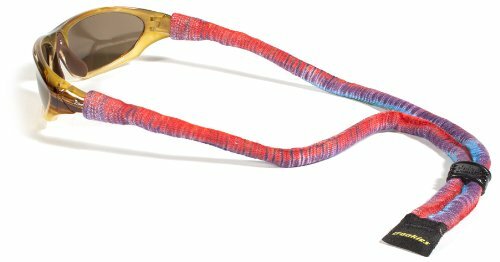 Made of knitted polyester yarn, these Croakies feature a vibrant and original Sunrise tie-dye print from Jammin On. Easy to care for and washable; 28 inches long; fits small to medium sized frames; made in the USA. Croakies has been creating stylish, durable, and functional products for life's everyday adventures for more than 40 years.